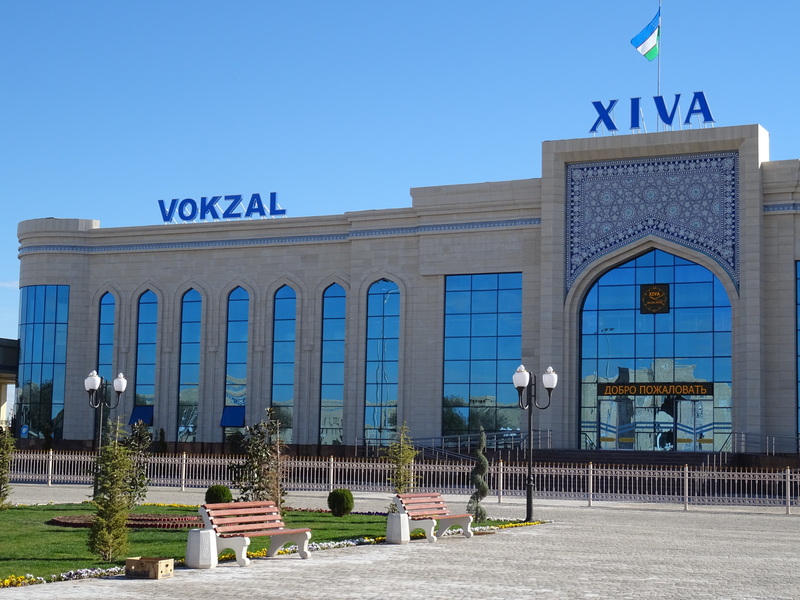 Uzbekistan’s three great Silk Road cities are Samarkand, Bukhara and Khiva (although the cities of the Fergana Valley were also important crossroads); they’re all different, and I’m not sure which one I preferred. I was intrigued by the different patterns of historical decay and restoration in the three cities. In Samarkand the Registan was left to decay under the Soviets (one of the minarets of the Ulug Beg madrassa collapsing in the 1920s) and the surrounding area was cleared in the 1960s to build four-storey apartment blocks. In 1967 the regional headquarters of the Communist Party was built on the former citadel, then another medieval quarter was demolished and the sixteenth-century Mirzo baths were replaced by a big restaurant. All of Timur’s fabulous gardens have also vanished. The Registan did see massive restoration in the 1980s and 1990s, and the remains of the Bibi Khanum mosque were rebuilt; across the road, the dome of the Bibi Khanum mausoleum is also totally new. In 1996 the houses around the Gur-i-Amir, the lovely mausoleum of Timur, were cleared and the quiet backwater that reminded Wilfred Blunt of an English cathedral close was replaced with a sterile park. The nearby Aksaray mausoleum has also been rather over-restored, by the look of it. German experts have been working in Samarkand since 1991 and have fixed the problems caused by poor restoration and heavy rain at the Tilla Kari madrasa (religious college) in the Registan, and are now turning their attention to the fifteenth-century Ishratkhana mausoleum, a little-known architectural jewel a kilometre or so south of the centre, so one can hope that this will be subtler work than elsewhere. The latest problem is that private developers are demolishing houses to build hotels and apartment blocks, notably in the Tsarist quarter immediately west of the historic centre – this is also supposedly protected by UNESCO and the demolitions are clearly illegal, but the local government is if anything encouraging them. In Bukhara, far more of the medieval city centre has been preserved than in Samarkand, although it has been opened up, and supposedly tidied up, by clearing many of the buildings between the main sights. The Soviets left the city to decay, and demolished all but three of the fifty-odd covered trading domes, so that it became unbearably hot to get around the city in summer and the population largely decamped to modern suburbs (in fact, Bukhara was one of the first cities to develop suburbs, as a result of the Arab conquest of 709, so this was history repeating itself). Fitzroy Maclean came here in 1938 and then in 1958, when he noted that it had been tidied up almost beyond recognition, with the ancient walls and gates mostly swept away and boulevards driven through the maze of narrow, winding streets, and was clearly set to become a tourist centre. Geoffrey Moorhouse made the same observation, also noting that the unrestored domes were topped by storks’ nests but that the storks (the national bird) had not been seen since nearby wetlands had been drained. There’s been a lot more restoration recently, unfortunately involving laughable plastic storks on rooftops, and it’s also been a bit gung-ho at times – in 2017 a wrong-headed decision was taken to lower the roads to their medieval level, destroying many archeological remains in the process, and causing part of a madrasa’s façade to collapse. On the other hand, I was impressed by the new hotels which fit in very well with the traditional style – and some of them really do deserve their ‘boutique’ tag. Some of the city’s many disused madrasas are being re-used as hotels, restaurants and museums, but there are many more if you fancy investing. 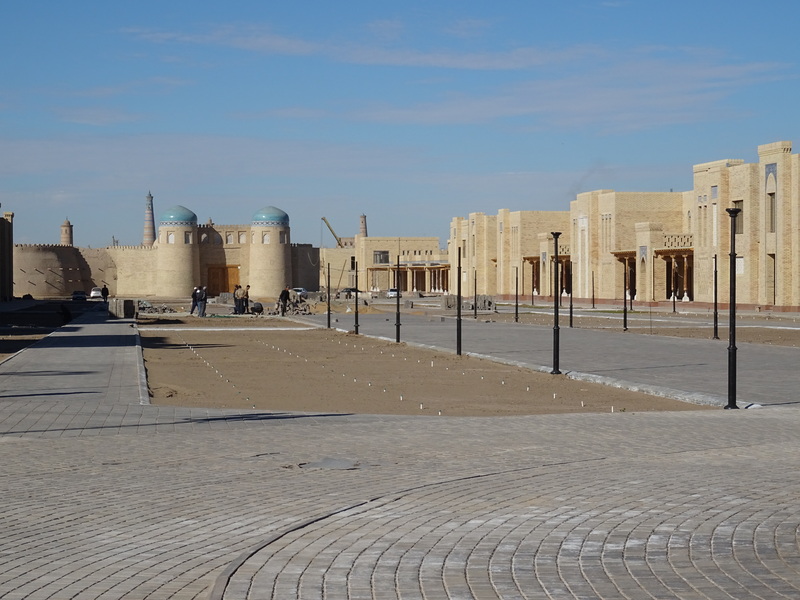 The same is true of Khiva, the smallest of the three, which was largely abandoned when Urgench, 30km to the north, was chosen for industrial development. It was effectively a museum city by 1999, with the feeling of a ghost town – although it’s ironic that many of its madrasas and minarets were actually built in the early twentieth century. Now it’s buzzing with tourists, at least in spring and autumn, although it’s far too hot to visit in summer and too cold in winter. There are three hotels in converted madrassas (one in the old town and two outside) – they lend themselves really well to this recycling, with their monastic cells around a pleasant courtyard. In Khiva, I went to see the new train station (they’ve built a branch from Urgench, and now need to electrify it to extend the Afrosiyob high-speed trains here – sometime in 2019, I believe) which is about a kilometre east of the old town – and there’s a great traffic-free boulevard which will be lined with hotels and shopping complexes. I’m assured that this was an area of markets, not housing, and that a new bazaar is under construction nearby. 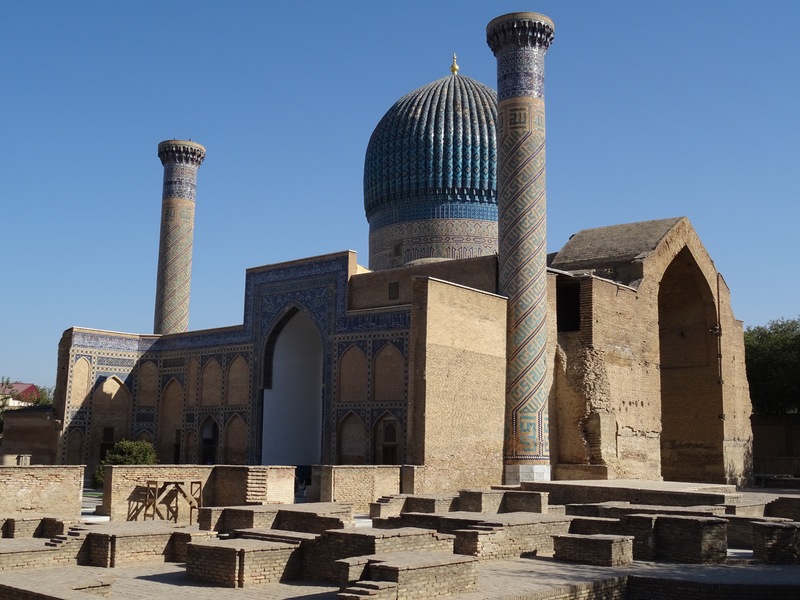 The Bradt guide to Uzbekistan gives a good account of the city’s amazing array of mosques, mausoleums and minarets – but it doesn’t really say much about its museums. There’s a 100,000 som (USD12) ticket that covers all 15 of the old town’s museums, but most of those museums are of very limited interest – so I’ll have to give some guidance. Still, it’s reasonable value if you visit a few of them. In the new town, the Nurillabay Palace has just been restored and reopened – it was only built at the start of the twentieth century, and there are a couple of galleries of below-average art. 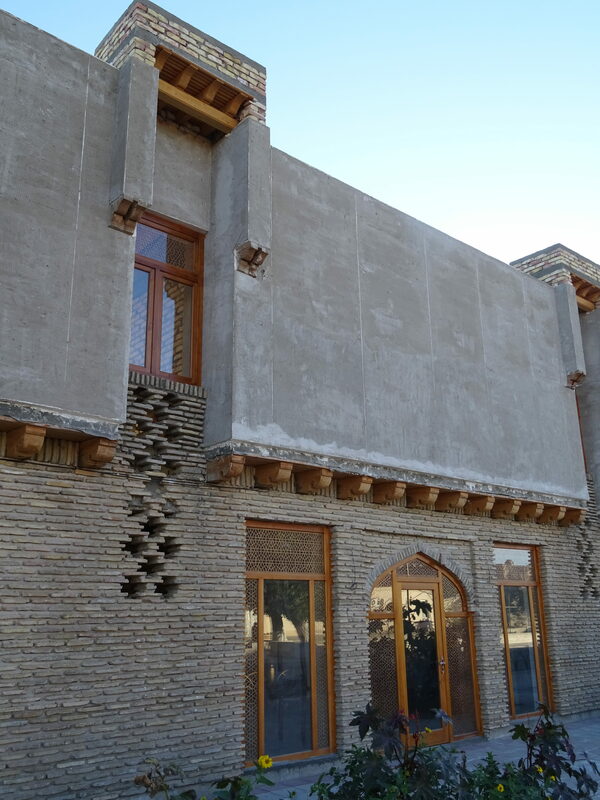 The only exhibit of interest is of historic photographs of Khiva under the khanate. For this they charge 50,000 som (USD6) – more than twice as much as any other museum or monument I’ve visited in Uzbekistan, apart from the Registan in Samarkand, which costs 30,000 som and is worth every one. I did say in my previous post that there’s been a move towards abolishing separate charges for photography in museums, but I then noticed that this was less the case in Bukhara – happily, Khiva fell into line with the trend I’d spotted elsewhere – phew. The current edition of the Bradt guide also issues a heart-felt plea for a restaurant – any restaurant – in Khiva to stay open out of season, and I’m happy to report that their prayers have been answered, and several places will be open all winter. This is despite the bone-crunching cold that people can already feel on its way – tourists are still enjoying mid-October sun, but the locals are huddled in their wonderful padded ikat jackets. I think I may have to buy one.